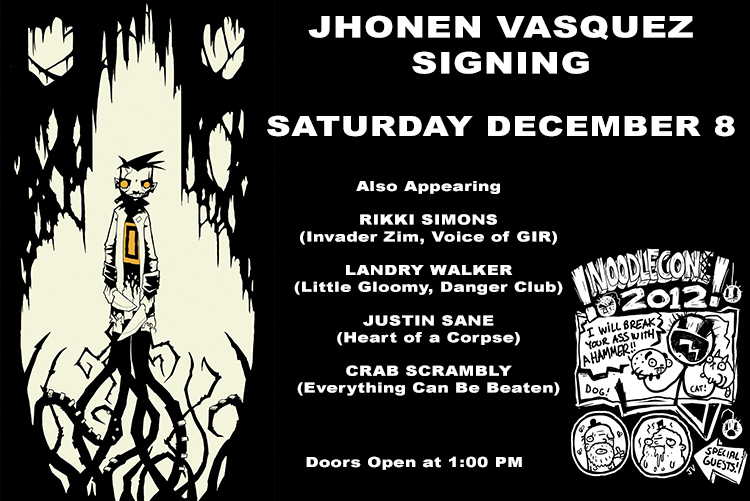 Jhonen Vasquez Signing and Comicsplus! Have you ever wanted to meet me? Okay, then, what about JOHNNY THE HOMICIDAL MANIAC and INVADER ZIM’s Jhonen Vasquez with a side order of me? Then get yourself down to SLG Publishing‘s ART BOUTIKI in San Jose on Saturday, December 8th and meet us and your other SLG favorites Landry Walker and Crab Scrambly (as well as writer, artist and the voice of ZIM’s GIR, Rikki Simons)!